Collection and delivery of retail furniture to all your outlets across the UK. At Hyden UK our years of experience in the shop fitting and retail maintenance sector has helped us to expand and we have listened to our client's needs. We have had an increasing request to pick up items of display equipment and architecture and deliver to another location. 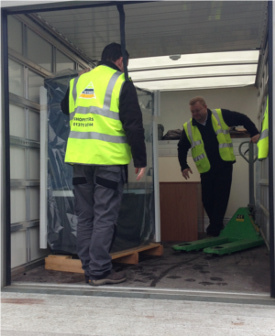 Whether it be a glass gondola or a wall mounted display cabinet, our experienced team of fitters can dismantle (if possible) safely wrap and protect, before securely loading into one of our fleet of vehicles. Hyden UK are proficient in carrying out all the required paperwork and permit applications to enable deliveries to be made to any shopping centre or precinct, so the stress is taken away from you. Out of hours service is available as Hyden UK appreciate that often visual merchandising and store moves are often done whilst the store is closed in preparation for the big unveil the next trading day. If you would like to discuss your requirements with one of our experienced surveyors, please do not hesitate to contact us. We will provide you with a competitive quotation for a service that we are confident that you will be more than happy with.